Many villages sprang up along the railroad lines as the rails stretched across the barren prairie, bringing new life and hope for good times and good fortune. Settlers in each of these hamlets were sure that their town was going to grow to be the trading center of the area. But the railroad tended to establish these villages close together – some only three miles apart. The closeness of these villages must have given the settlers a feeling of safety and assurance as they looked out to see other tiny towns on the horizon. But many of these early settlements did not account for the sparseness of the population that could not support so many trading centers. Lyon County has seen many of these villages fall by the wayside, a total of 17 “Ghost Towns” dot the prairie in this county alone. They all had a proud beginning and a heartbreaking ending. The village of Florence has lost its once bright existence as a town, but still has a handful of residents who can remember the hopes and aspirations of the past. In its day, Florence was a thriving little place of business. Florence was founded in 1888 on the northwest quarter of Section 20 in Shelburne Township. 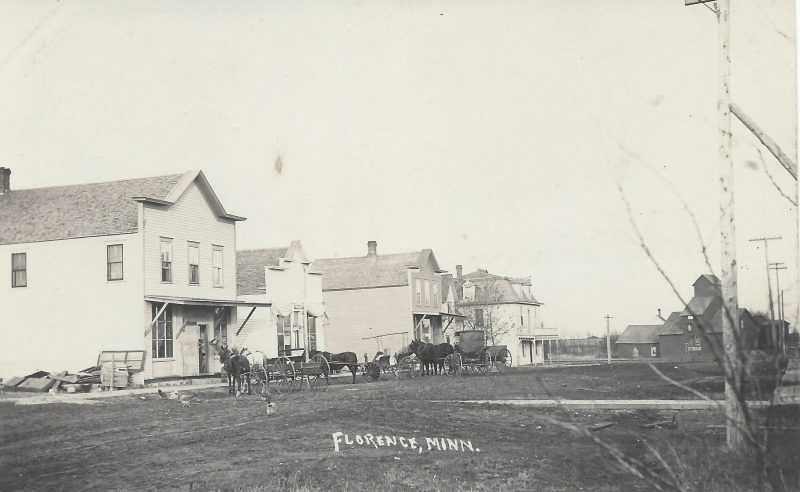 When the Willmar and Sioux Falls Railroad (branch of the Great Northern) came through the area it was announced that the station would be named Florence. It was named after the daughter of the founder, W.H. Sherman, who purchased 80 acres from H.P. Sanden and had it platted into seven blocks running north and south. 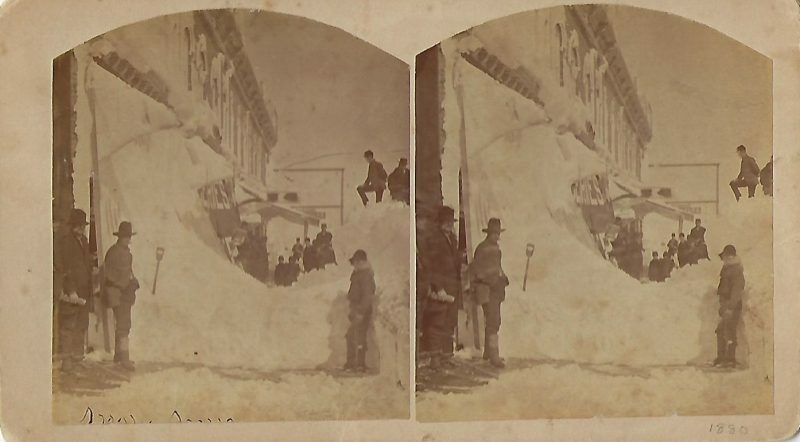 The streets were named Morton and Harrison, and the avenues were Garfield, Lincoln, Logan and Blaine. Actually, the first settlers came to the area in 1871. The Opdal Norwegian Evangelical Lutheran Church was established in 1878, (10 years before the village was founded) and incorporated in 1879 at the Edward A. Berg home. The first pastor was the Rev. Martin Shirle. The first church building was built on land donated by H.P. Sanden for a church and cemetery site, located northwest of Florence. A few years later the church was moved to Florence and added onto. The history of the Florence school antedates that of the village itself. In 1884 school district 47, located in the southwest quarter of Shelburne Township, was organized and a school house was built on the C.P. Myran farm. In 1893 school district 78 was organized and a schoolhouse erected in Florence at the cost of $750. Forty-five pupils enrolled. The first store was a general store, the second a blacksmith shop. In 1893, the village advanced rapidly to include a second general store, hotel, implement business, grain warehouse, harness shop and shoe store. There was talk of incorporating as a village in 1902, but that never happened. In 1908, the State Bank of Florence was built and opened with a capital stock of $10,000. An addition was erected in 1918 – only to close during the Depression of 1929. The final train service was on February of 1960, and in 1962 the depot closed when the Russell and Florence stations merged. The school closed in 1966 and merged with Tyler; the building was later demolished. Opdal Lutheran Church conducted its last service in 1975. In 1987, the vacant building that had once housed a restaurant was demolished and the ground cleared. A shelter was built by volunteers and playground equipment set up on the grounds for the Florence Park. The Post Office closed in the late 1980s. Was it the advent of the automobile and mechanized farming that dealt the death blow to this once flourishing village? As happened to many villages and towns across our country, businesses disappeared and population dwindled. The sign outside of Florence read “Population 51” in the 1980s. As of 2018 that number has dropped to 38. A once flourishing village may now be close to becoming a “Ghost Town” on the prairie. Sources: History of Lyon County, Minn., 1912, A.P. Rose; “Florence, MN 1888-1988,” Doris Schmidt.